Nothing suitable in promotional calculators? Promotional Calculators and branded desk calculators are an ideal promotional gift for the office environment and a business essential. Especially for any financial related promotions, promotional calculators are simply the ideal give away for the financial sector, such as banks, mortgage companies or simply cost effective products that you would like to promote! Our fun range of office promotional items and promotional calculators includes environmental calculators- that are run on solar or water powered calculators. They are environmental and relay a caring corporate message to your clients. 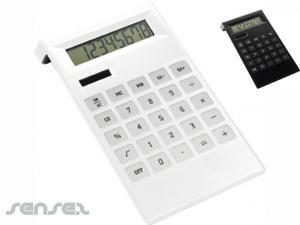 For an environmental cost saving promotional approach chooses our H2O water powered calculator! Innovative and definitely eco! We also offer a range of fun liquid filled calculators in different styles, with custom printed floater and your choice of liquid colour. 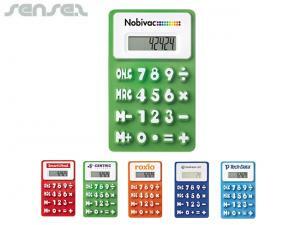 Or choose more designer, stylish acrylic calculators that are just to die for, with your logo engraved or printed of course! A fun approach to the office are gun shaped calculators, great for a fun promotional gift with a twist, such as banks, mortgage companies or financial institutions with humour! This would be a well remembered promotional give away! For a more flexible approach to finance, choose our flexible calculators, ideal for a clever promotional message for flexible banks or finance institutions or accountants! 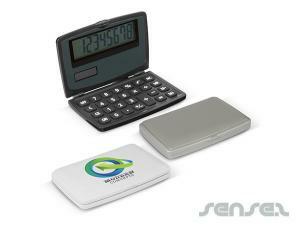 Pharmaceutical companies would love the pill shaped calculator, ideal to promote any pharmaceutical products with doctors! 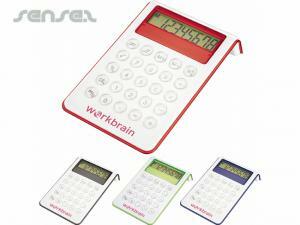 Or for the office, a useful and cost effective calculator give away would be the letter opener calculator or the fun bendable flexible branded calculator. 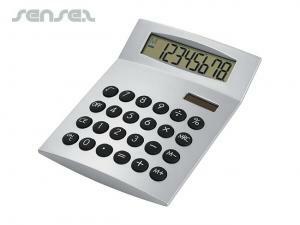 A very cost effective promotional calculator is our slim pocket size credit card shaped calculator. For the trade an ideal tool would be the measuring tape calculator with integrated measuring tape and calculator all in one useful practical promotional tool! If you are aiming for the office environment, then choose from our range of mouse mat integrated calculators with custom printed mouse mat or our promotional rulers with integrated calculators all with logo print. One of our favourite office giveaways is also the notepad with integrated calculator on its cover! Ideal also for conferences! Our range of branded mouse mats with integrated calculators are also ideal for the office desk, integrating the much needed mouse mat with the needed calculator in one handy promotional gift. Another effective tool for promotional advertising are the calculator integrated rulers with your custom logo print or corporate message.